You can also use bigger knots such as the figure-9 or figure-8 double loop. Either way, make sure the knot is big enough so that it can't be pulled through the chain or carabiner at your main anchor point. To be extra safe, use two opposite and opposed screwgate carabiners. You can also abseil in the same way using two ropes. Instead of joining your ropes with a double fisherman’s, you could also use a bigger knot such as the re-threaded figure-8. 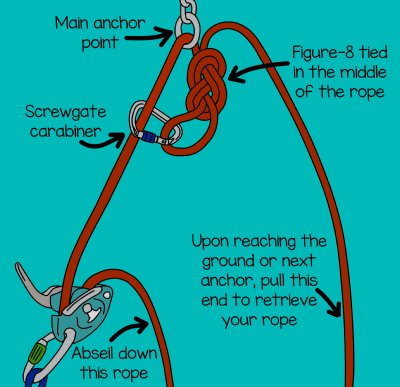 Just make sure the knot is big enough so that it can't be pulled through the chain or carabiner at your main anchor point. In the unlikely event that the knot slips through the chain at the main anchor point, you won't be able to pull your ropes down. To solve this problem, tie a prusik knot (klemheist works well) around your descent rope with a long piece of cord. Use this as a foot-loop. 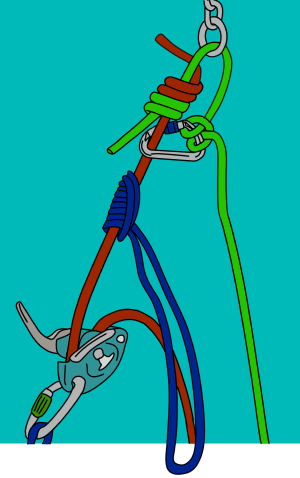 Stand in the foot loop and pull the rope through your GriGri. Then rest on your GriGri and slide the klemheist up the rope. It's a good idea to back up your GriGri by tying a clovehitch to your belay loop with a screwgate carabiner as you go up. It'll be hard work, especially on overhanging terrain, but if you need your ropes to do another abseil, it'll probably be your only option. Make sure to ascend the same rope that you descended! - Avoid using this technique on low angled terrain: The extra bulk of a carabiner and bigger knot is more likely to get stuck on something when you retrieve your ropes. - Make sure you attach your GriGri to the correct side of the rope. 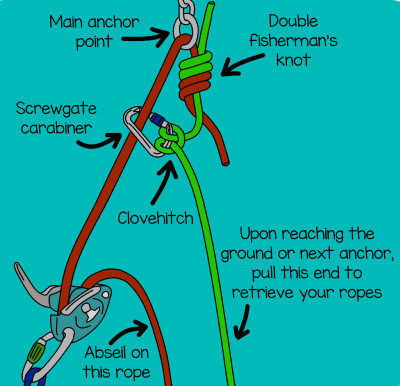 - Always make sure you test the system before you detach yourself from the main anchor point.